Having a recliner in general whether powered or manual, already places you in the best seat in the house. But for an optional extra, why not consider an adjustable headrest. Whether you are sleeping, watching television, reading or just resting and relaxing, an adjustable headrest just adds to give you more superior comfort and support, so that you can relax from head to toe. When it comes to a recliner or even a reclining office chair, where you spend many hours of the day in, your posture and good support play a large role in relaxation, productivity, as well as your overall health. An ergonomically designed chair or recliner with an adjustable headrest can provide you with good support and comfort to prevent and relieve neck, shoulder and back pain. With an adjustable headrest and an ergonomically shaped recliner you will always be in a position where your posture is enhanced and your spine well enhanced, thus providing superb comfort and relaxation. An adjustable headrest allows you to take a break and relax, and sleep in a comfortable position that fully supports and cradles your head and neck, for better sleep and better relaxation. An adjustable headrest will adapt to whatever position or purpose you require it for with ease, to ideally cater to your needs. For individuals with ailments or special needs, an adjustable headrest in a comfortable and supportive reclining chair, can offer them therapeutic support and relief. Before you decide on a recliner with an adjustable head rest, there are two major points to consider, will you be opting for a Power or a Manual Recliner. 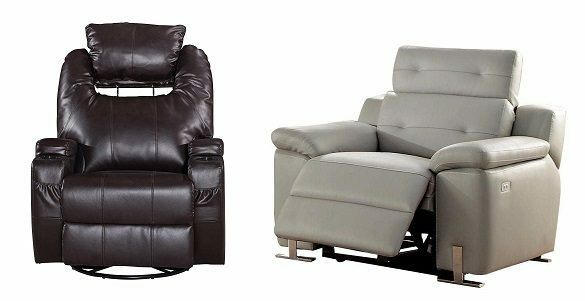 The difference between the two being, that the Power recliner is operated with electricity, much more user-friendly, but likewise restricting, heavy and expensive. Whereas a manual recliner requires some elbow grease to operate, has fewer features, but is easy to move around, light, and fairly affordable. With a manual recliner the headrest will have to be adjusted by hand or push back recline, whereas with a power recliner your headrest can be adjusted with the push of a button. When you have decided on a manual or power recliner with an adjustable headrest to suit your needs, take into contemplation there are many other features and characteristics involved with comfortable and functional recliners. Then equally, there is the aesthetic and size factor, you need to consider the décor and style of your home, along with the space you have available for the recliner to blend in and fit in, when fully reclined. The size of the recliner according to your physical body type and space available in your home. Recline Positions, or Zero Gravity. Cup Holder or laptop table. Rocking, Swiveling or Gliding function. A superb choice in home theatre system recliners, the Seatcraft Monterey has all the trimmings and comfort features for the complete movie theatre experience. An adjustable powered headrest for the highest level of comfort. This chair is upholstered in the finest elegant and durable top grain leather. Power recline function with the push of a button. Features a handy cup holder, USB charging port, tray table and hidden arm storage. The cup holders are lighted and there is ambient base lighting as well as accessory grommets for further convenience. The Artist Hand Massaging recliner is a true work of art that will give you superior relaxation and a therapeutic massage in the comfort of your own home. A modern yet still stylishly classic design that is expertly crafted to be the perfect accent to your living room, office or bedroom. Upholstered in soft and durable PU leather that is easy to clean and maintain. A solid wooden frame and high-density sponge padding for comfort and durable support. There is an 8 point massage function, a heating system and five massage modes to choose from. Each is of your body can be massaged individually to relieve stress and tension. The headrest is fully adjustable with the touch of a button. Easy and quick assembly with no tools required. The perfect Gaming or Office chair, which offers you superior lumbar support as well as neck and shoulder support with the adjustable headrest. A large and wide seat with a thicker back and deeper bucket in the seat for extra comfort and support. A multifunctional 360-degree swivel and adjustable reclining back, from 90 degrees up to 180 degrees. Features a class 3 explosion proof lifting function and premium rolling casters that are quiet and will not scratch your floor. The ergonomic design offers three-point support for your head spine and lumbar area, with an adjustable and removable headrest and a lumbar cushion. Available in a few racing stripe theme color options. I would highly recommend the Seatcraft Solstice as an option if you are looking for a somewhat theatre type recliner to watch movies and TV shows in. It has some exceptional features that can extensively enhance your movie or television watching experience. Upholstered in soft and durable top grain leather for an elegant touch and appearance. The headrest is power adjustable and this chair offers you exceptional lumbar support. Power recline into the position of your choice with the touch of a button. Each seat comes pre-installed with a bass sound shaker all you need now is the amplifier. The IMG Divani recliner, is a manual option that offers you the added characteristic of being able to adjust the headrest to suit your personal requirements fully. A comfortable and space-saving recliner, ideal for a small home, office or apartment. Manual recline function and a manually adjustable headrest. A highly functional rocker and glider recliner in one for unsurpassed comfort and relaxation. The Divani can swivel up to 180 degrees when powered and 360 degrees manually and has an integrated footstool to rest your feet on. Upholstered with genuine IMG Trend leather that has a rich and supple feel to it, and is likewise available in a few color options. The height of the chair and headrest is fully adjustable for better neck support. The Cold Cure molded foam filling ensures luxurious comfort, support and long lasting durability. The perfect loveseat for a couple, or even for kids and family to enjoy. The Jamie Living Demarco comes with fully adjustable headrests, lush foam cushioned seats and two power reclining positions. Upholstered in durable and high quality dark brown top grain leather. A hardwood plywood frame that is tough and durable for long lasting support. The outside arms are padded and the back is padded with no-sag sinuous Spring Construction, and a high density [polyurethane foam seat cushion wrapped in durable fiber. The headrest has a manually adjustable ratcheting function and the chair can recline into two positions.